How will I know if I have scarlet fever? When will I know I am cured of scarlet fever? When should I contact a physician about scarlet fever? 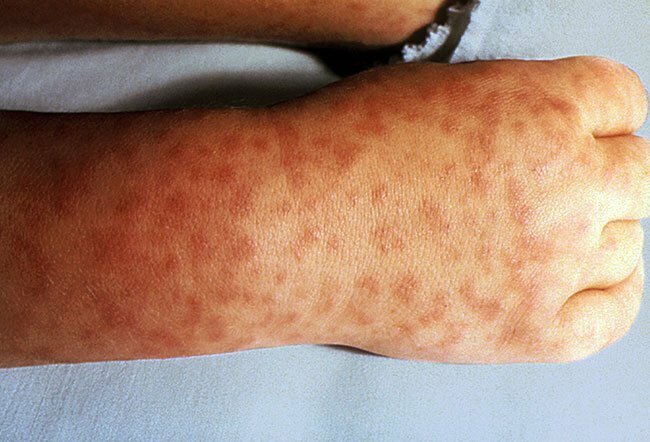 Scarlet fever may be contagious if a person becomes infected with a group A streptococcal bacterial strain that produces the scarlet fever toxin. However, not all people who get group A streptococcal infections develop scarlet fever; only a small percentage of these patients go on to develop scarlet fever. The red rash may develop later than other symptoms (up to about seven days later). The physician can give a clinical diagnosis from the patient's history, physical exam, and possibly a rapid strep test; in some individuals, a throat culture may be done to determine if group A strep is the infecting bacteria. The bacterial infection (strep throat or skin infection) that results in scarlet fever is contagious, but some people will get the infection (such as strep throat) without going on to develop scarlet fever. Consequently, scarlet fever spread is the secondary result of the way most group A streptococcal infections are spread -- by direct person-to-person contact (kissing, touching mucus membranes, for example) and by indirect methods such as contaminated eating utensils, cups, and other objects used by infected individuals. However, not all individuals who get group A streptococcal infections will develop scarlet fever. The incubation period for scarlet fever has a fairly wide range from about 12 hours to seven days. Individuals are contagious during this first subclinical or incubation period and during the acute illness. The primary strep infection is the contagious aspect. Scarlet fever can be treated with antibiotics because once the streptococci bacteria are debilitated or killed, they stop producing toxin and the rash will slowly fade away. A medical caregiver can help diagnose scarlet fever by doing a simple strep test or, if indicated, can culture the throat to confirm a group A streptococcal infection. Individuals with scarlet fever need to be treated quickly with antibiotics to reduce the chance of developing long-term health problems such as rheumatic fever, kidney disease, ear infections, and other types of infections. An individual should see a medical caregiver if they have had a recent infection of strep throat and then develop the symptoms of scarlet fever (especially a reddish rash on the body). It's important to have a physician evaluate the patient to be sure that appropriate diagnosis and treatment (antibiotics) take place quickly to avoid or reduce the chances of any of the complications of scarlet fever such as organ impairment (of the kidneys, heart, joints, for example). "Scarlet Fever: A Group A Streptococcal Infection." Centers for Disease Control and Prevention. Jan. 19, 2016. Please describe your experience with scarlet fever. What prompted you to seek medical care for scarlet fever? How quickly did your scarlet fever treatment work to cure your symptoms? Cipro, generic name ciprofloxacin, and Keflex, generic name cephalexin, are antibiotics that belong to different drug classes. Cipro is a type of fluoroquinolone and Keflex is a type of penicillin. Cipro and Keflex can cause similar side effects like abdominal pain, diarrhea, nausea, vomiting, headache, and skin rashes. Keflex has fewer serious side effects than Cipro, for example, anaphylaxis, a type of severe allergic reaction. Cipro and Keflex both can cause a serious infection with C. difficile, which causes severe, chronic diarrhea and may lead to pseudomembranous colitis. Cipro has many serious side effects, for example, Achilles tendon rupture, peripheral nerve pain, CNS problems, high blood sugar, abnormal heart rhythms, hepatitis, yellowing of the skin and eyes (jaundice), liver failure, acute kidney failure, cardiac arrest, and respiratory failure. Cipro and Keflex are used to treat bacterial infections, for example, infections of the ears, skin, bone, urinary tract, and C. difficile (infectious diarrhea). Cipro also is used for the treatment of lower respiratory infections, sinusitis, chronic prostatitis, TB, typhoid fever, cystitis, the plague, anthrax poisoning, and bronchiectasis. Keflex also is used for the treatment of infections of the middle ear, tonsils (tonsillitis), bronchioles (bronchitis), laryngitis (larynx), and lungs (pneumonia). Scarlet fever, a bacterial infection caused by group A Streptococcus bacteria, causes symptoms and signs such as fever, rash with a sandpaper-like texture, and sore throat. Oral penicillin is the standard treatment for scarlet fever, or scarlatina.